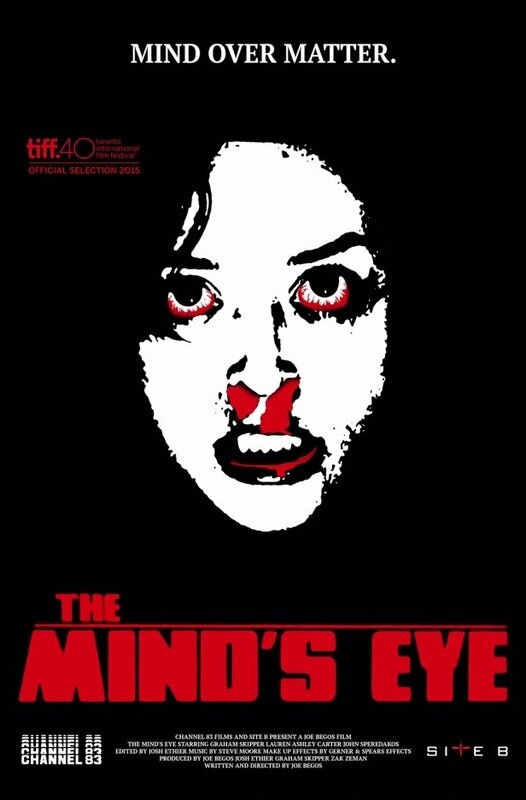 The Mind's Eye is about Zack Connors and Rachel Meadows, two people born with psychokinetic abilities who are patients at an institution headed by Michael Slovak, a doctor determined to harvest their powers. When Zack and Rachel escape the institution, the deranged doctor is obsessed with tracking them down to continue his research and gain control of their abilities for himself. Graham Skipper and Lauren Ashley Carter are perfect for the roles of Zack and Rachel. The two convey a tortured demeanor that shows their psychokinetic powers as more of a curse than a gift, this is demonstrated nicely in the opening of the film in a scene involving Graham Skipper. Skipper has very expressive eyes which highlight many moments in the film and he gives a solid performance as Zack. But I really want to focus on Lauren Ashley Carter who has a screen presence that is undeniable. She elevates every scene she is in and has an intensity within her that makes it impossible to take your eyes off her. After seeing her in Pod, Darling, and now The Mind's Eye, it is clear to me that she's a star, plain and simple. I can't praise her enough and she should be on everyone's radar. The Winter landscape in the film is a nice symbolism for the studies being done at the Slovak Institute where the psychokinetic abilities of the patients lay dormant due to a created serum that is injected into them. But just like the snow will eventually melt, the serum too has a time limit and will eventually wear off. After Zack and Rachel escape the institute, it's only a matter of time until their powers are available to them again. The lighting creates a contrast between subdued and vibrant colors, a mix of whites and beige's with well placed neon sprays that highlight faces or backdrops. It speaks to the two abilities of the mind in the film: the normality of everyday use and average thoughts and the heightened use of psychokinetic ability. It's a language that runs through the entire film and becomes more apparent as the story progresses. Tying everything together is a soundtrack that is an energetic symphony of synth, science fiction sound brimming with action. It's powerful and big and plays well over the heart pounding emotions and action we see on the screen. The Mind's Eye does not shy away from blood and gore and it doesn't disappoint with it's effects. There's a few moments in particular that will have gore hounds cheering and losing their heads. The Mind's Eye is loaded with action, drips with blood, boasts awesome practical effects, has a killer soundtrack, and a mad scientist angle fused with a body horror aspect that is tons of fun to watch. Writer and director Joe Begos has created a classic in the vein of Cronenberg and Carpenter and there is something for everyone to enjoy in this movie. You know that kind of movie you wish they still made? The Mind's Eye is it and it needs to be seen. Yes I really like Lauren Ashley Carter's work I have seen a few of her films, DARLING being the latest. Hey did you see BEYOND THE BLACK RAINBOW? This film plot sounds just a little bit like that film. Anyways now I want to see this film. I haven't seen that one, I'll have to check it out! And yeah, definitely watch The Mind's Eye, it's a great time.